What is an Enlarged Liver? An enlarged liver is just that, where the liver has grown in size due to many unhealthy factors and or liver diseases. What Causes the Liver to Grow Larger than its Original Size? Unhealthy lifestyle choices such consuming too much high cholesterol greasy / fatty foods and or excess alcohol and drugs /synthetic medication. A combination of one or more of the above can cause the liver to be overworked and overloaded and as a result ends up storing fat inside the liver. What are a few of the most common signs of an Overworked Liver? Fatigue, its okay to feel lazy sometimes, but if you constantly feel sluggish and fatigued and you find that walking or exercise doesn’t help much, then this is another sign of an overworked / overloaded liver. Can an Enlarged Liver go back to its Original Size? Fortunately there is hope as it is possible for an enlarged liver to decrease in size and go back to its original size. But in order to do this successfully... you need to stop or slow down whatever is damaging your liver in the first place. Generally the main causes are high amounts of fatty and high cholesterol foods and or excess amounts of alcohol consumption. How can I start to help my Enlarged Liver go back to Normal? The liver is a unique, very special organ inside the human body, because of its ability to re-generate back fully to its original form like new. This can be done through by providing rich nutrients, vitamins, aminos and herbs to your liver on a daily basis and staying away, or at the very least limiting vices such as alcohol, smoke, drugs and unhealthy fatty foods. One piece of advice.... ALL healthcare experts will offer and strongly recommend to patients who have liver problems, is that you eat more healthy every-single-day. Unfortunately this "general advice" is easier said than done. 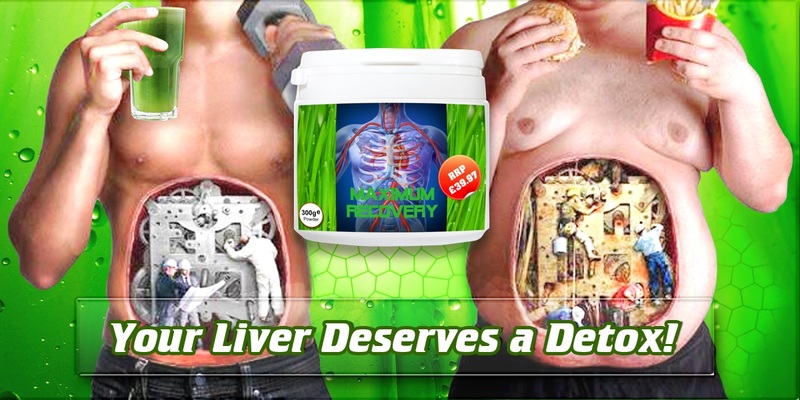 Maximum Recovery is a perfect healthy solution for the time poor... Forget “5 a day” Maximum Recovery contains 35 Super-Foods per scoop each organic ingredient contained within has a proven benefit for your Liver... best of all it just takes 30 seconds to prepare and consume!